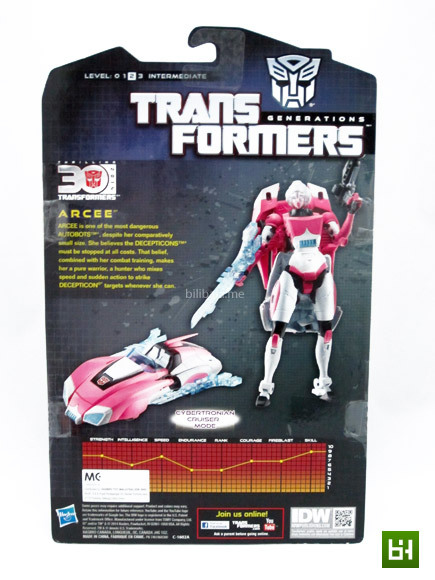 Transformers Generations Arcee is one of the most anticipated deluxe figures this year. 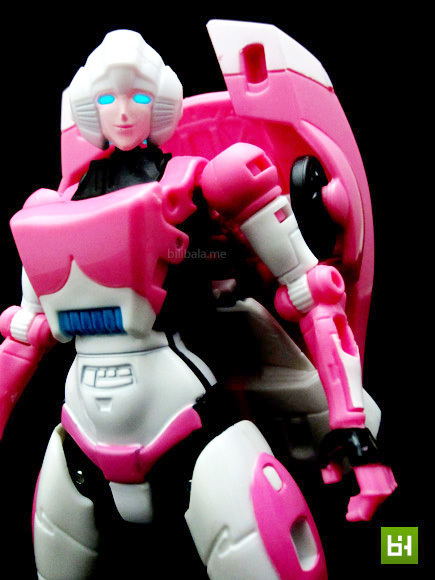 For years, fans all over the world have been longing for an official release of G1 inspired Arcee figure and Hasbro has finally heeded the call. 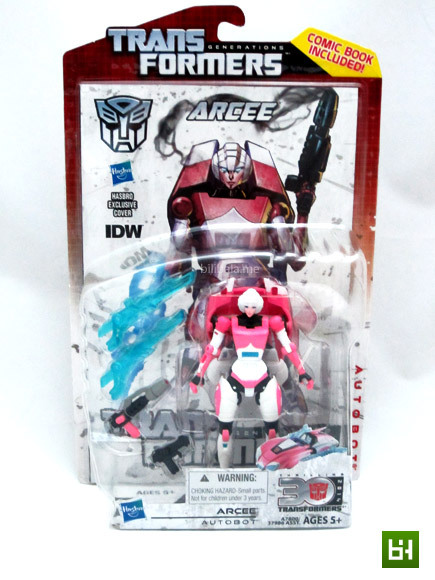 Looking back to my collection, Arcee is actually my most favorite character. Well, mostly because she is one of the very few female characters that has ever appeared. 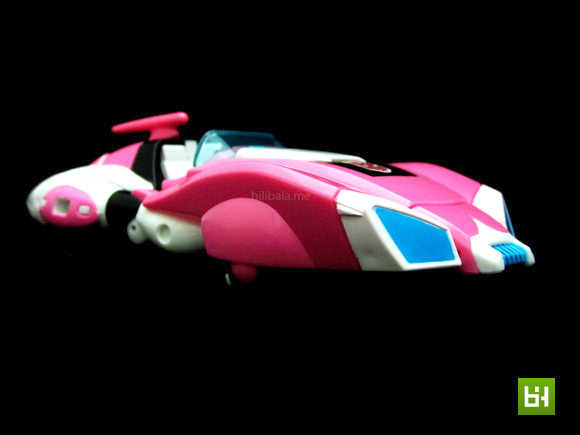 Secondly, she is also the few which transforms into sleek futuristic sport car during G1 time. So it is definitely a no-brainer for me to buy it on the spot without hesitation. 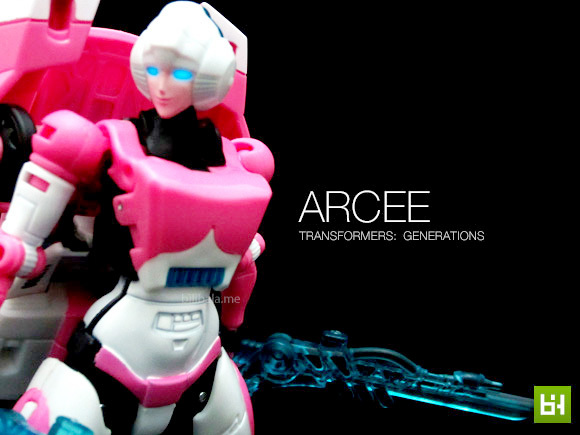 So, does this Generation Arcee nail it this round? Read on to find out. For the first time ever, all new Transformers Generations deluxes come generously with a comic book which is cleverly being packaged as the cover for the toy. 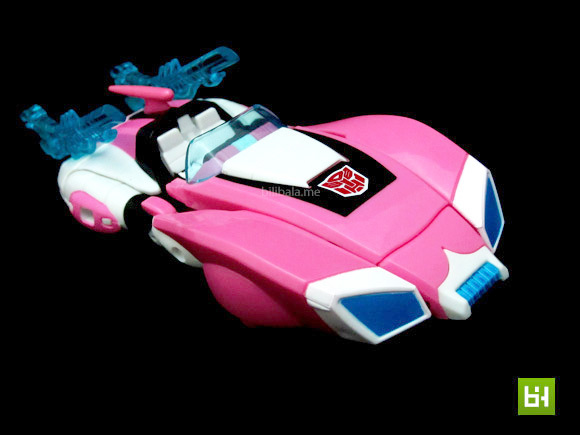 This makes the toy very worth collecting since the 26 pages comic already costs a bit if you buy it separately. 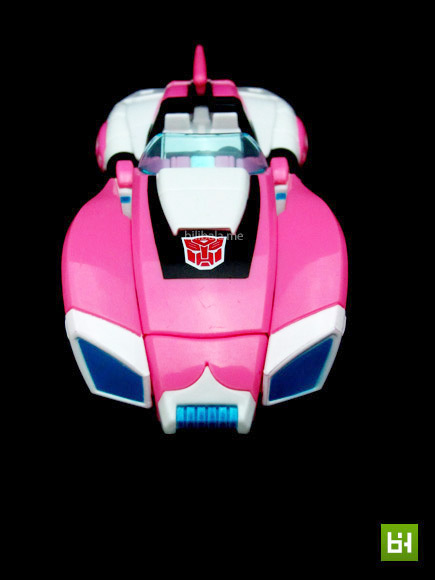 This does really show the effort of Hasbro in celebrating 30 years of Transformers by throwing in more perks. 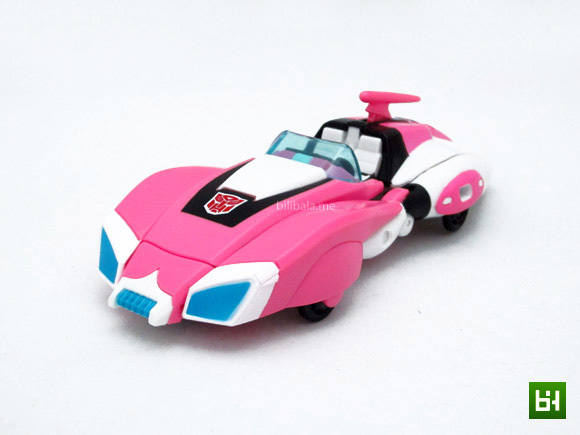 And of course, they are also rolling out other G1-IDW inspired characters that fans have been waiting for long. 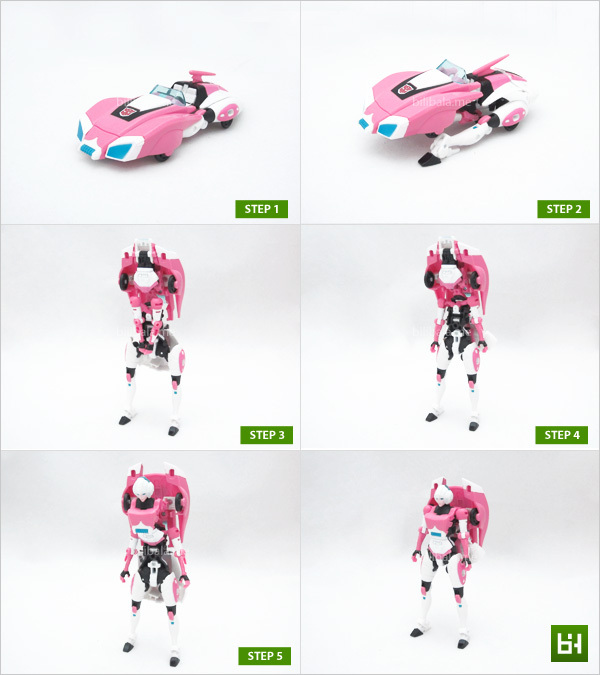 In commemorating the G1 Arcee, this generation deluxe follows closely the original design and with a twist of modern touch up based heavily upon IDW’s comic. 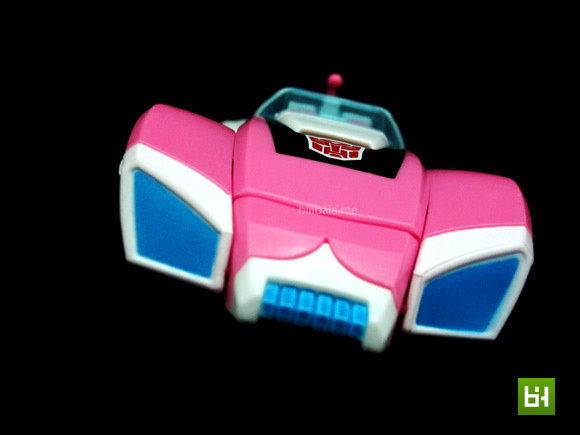 Some familiar G1 appearances (definitely easily recognizable) can be seen such as the front grill section of the bumper; the transparent windscreen driver section and the distinguishable car “antenna”. 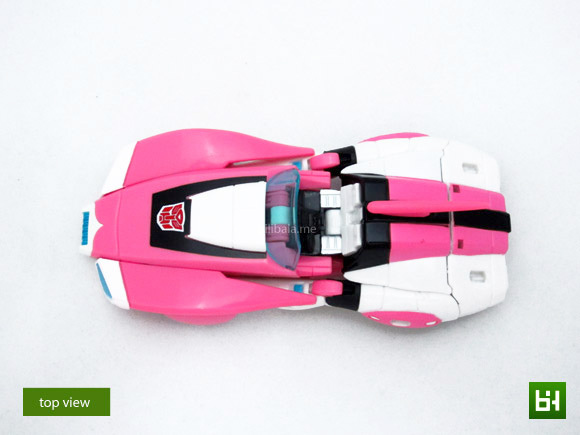 Of course, the color scheme is also not a miss: with dominant pink, white and black which definitely melts the heart of collector. Paint job of her is nicely done. 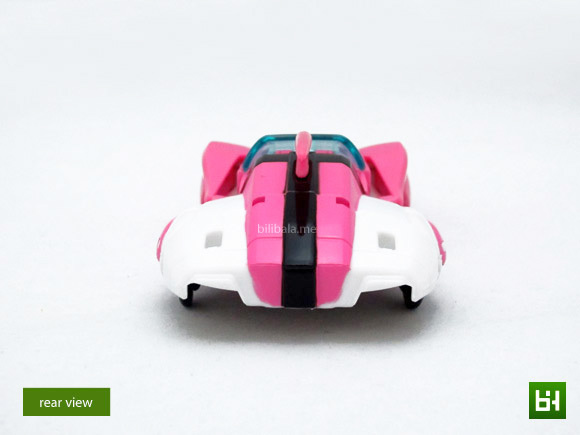 There are no color chips/smudges to be seen in alt mode so far. The figure does weight less but not as flimsy or delicate as she looks. 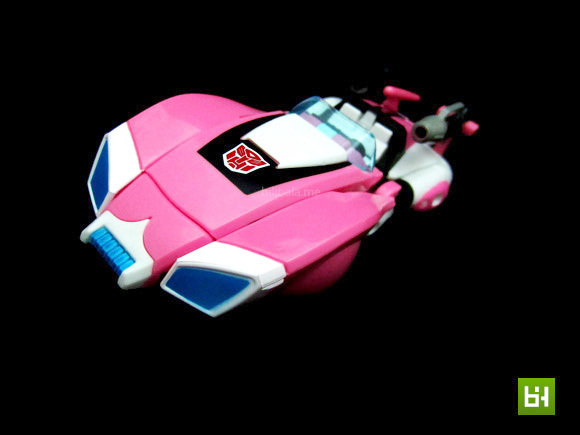 Much of the design details are quite streamlined and I personally really like the simplicity and the G1 design. 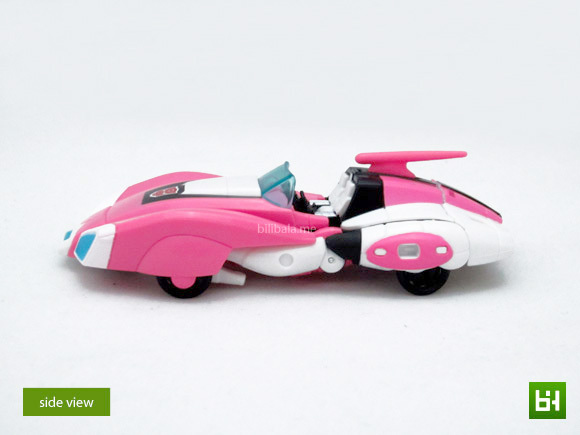 Well, there is actually a point of dislike which is the plastic of the wheels being used. They seem harsh and rough to be rolled on. Morever, the wheels are quite thin in size and quite sharp at certain points. Let’s go into detail of the driver section. Much efforts have been put in crafting smaller details of her. Driver and passenger’s seats for instance. How about a dashboard? Yup. It’s on the checklist. 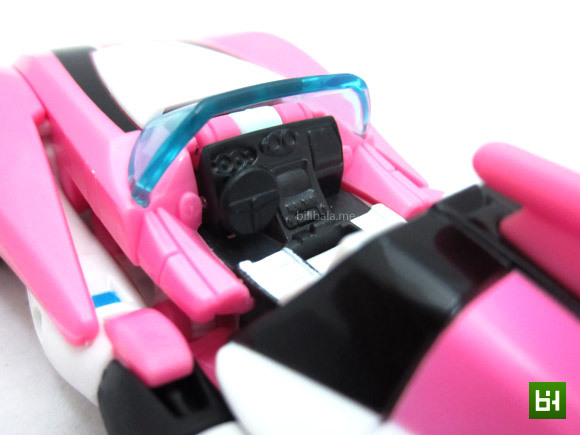 You can see the nicely sculpted steering wheel, meters and center console. Now, you definitely will be wondering, can a smaller figure fit in it? The answer is no, at least for figure with an inch and above. I guess those really small human figures like those come with Gundam’s model kit can be fit in nicely. 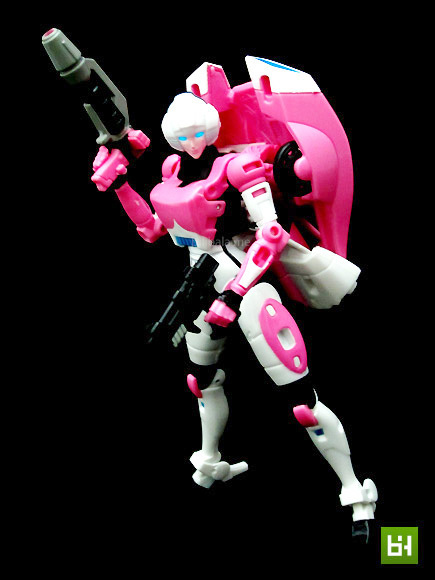 Move on to Generations Arcee in robot mode. 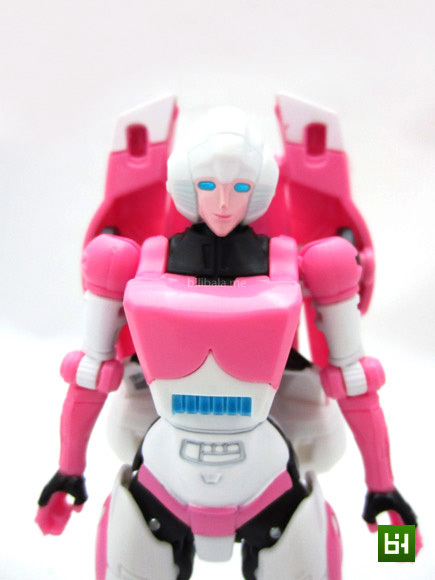 A figure that really captures the gist of G1. 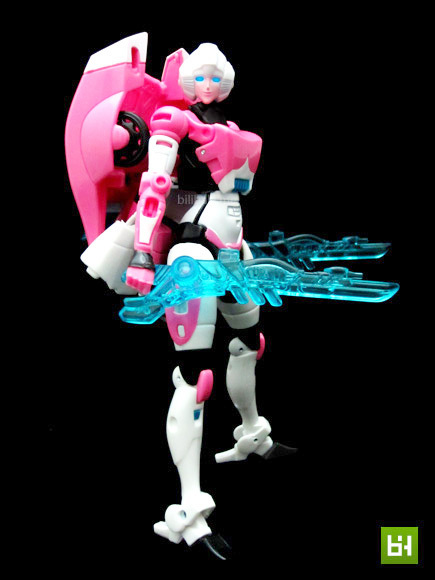 First impression of her: she is really sleek and slim, especially the limbs. Though they are thin, they are actually quite solidly built, not as flimsy as my Perfect Effect one. Quite minor paint being used here. Just the abdomen section which is painted in blue as highlight and dominant white with a curvy sculpture. I really like how they use the blue color to highlight the small details such as the knee caps and the upper abdomen section. 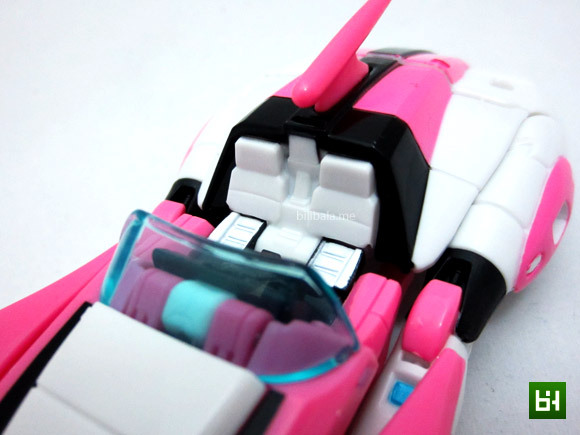 It kicks out the dullness of the white and pink color combination. Well, back kibble. Yes. But not as bad, seriously. 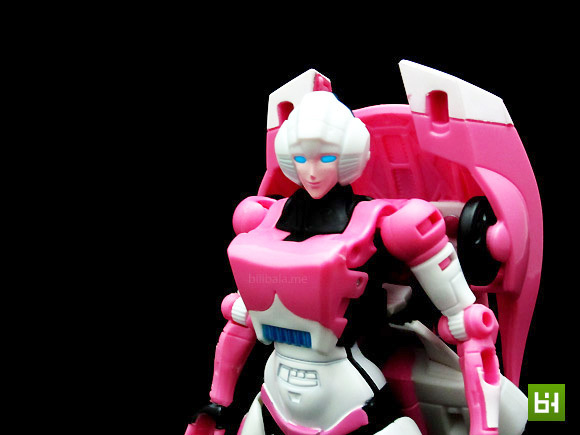 We all know that Arcee has it in the cartoon. Well, at least it is not that big. Fortunately it doesn’t affect much of the stability of the figure. 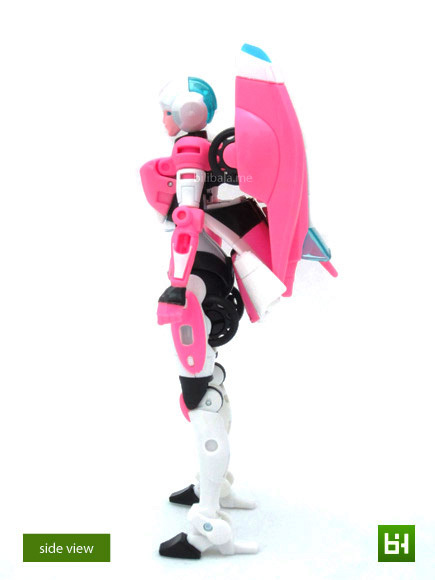 The figure is further being stabilized with extended heels she has. So be expected that she can do a lot of hoo-ha pose without worrying the figure to fall. Yes. Very big backpack view from the rear. Pretty much unavoidable. That actually is my only complain about this toy. She pretty much like wearing a heavy school bag. 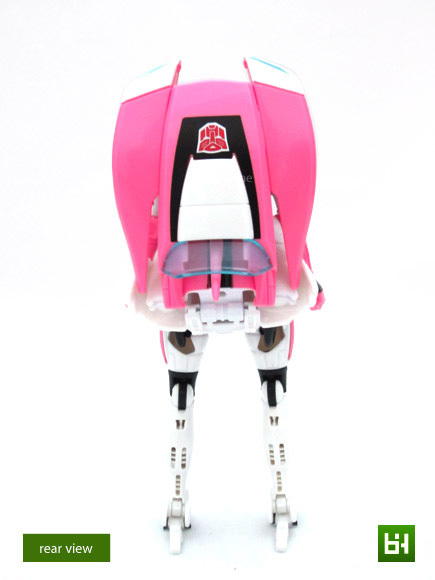 There’s some interesting “details” being crafted on both legs of her which is quite noticeable from the rear. Yes, pores or small holes on both of them. If you are a Trypophobia (phobia to pores) , it is definitely not a sweet sight to see. Not really sure the reason for it though, aesthetic? Simple but nicely sculpted headpiece. 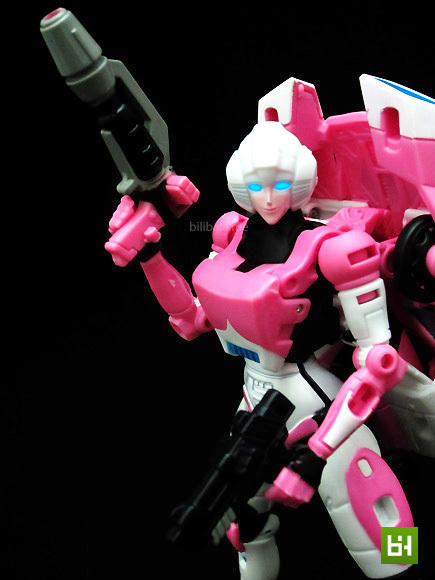 The pink face is actually painted. That’s where you need to check properly for paint chip when you are buying it. The light piped eyes are nicely done. Easily lit up the eyes with generous light intake at the back. Articulation is good. Again, missing waist joint. 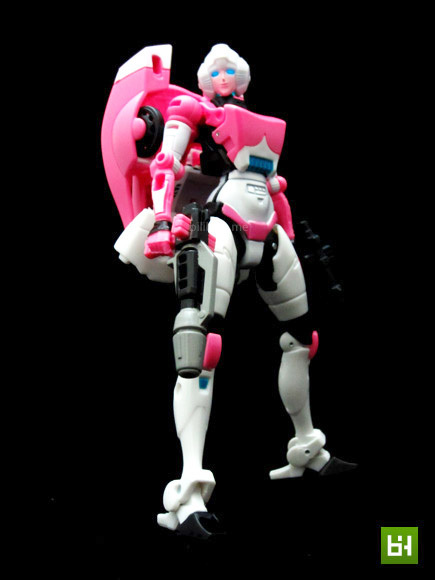 In all, it is still a very pose-able figure that will not disappoint you. Transformation is actually quite simple and straightforward. However, it is being done brilliantly. This is especially true on the part where the torso-back section is being transformed. 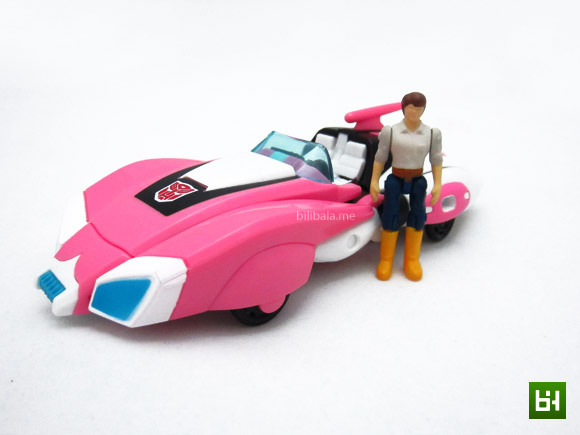 Here is a quick comparison of her with Spike Witwicky from the MP10 Optimus Prime. Proportion is good just that Spike can’t fit in the vehicle as there is no space allowance for the figure to be slotted in. Bummer. 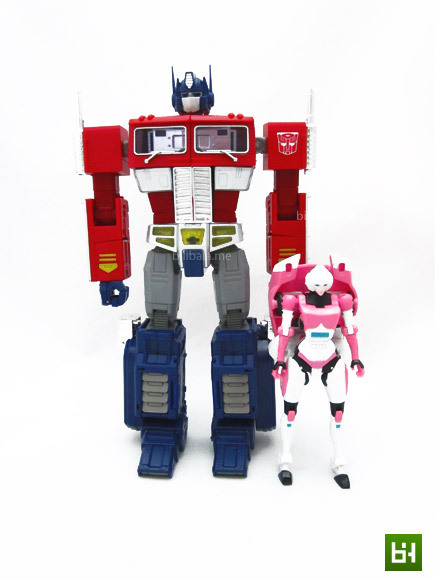 A side by side comparison with MP10 Optimus Prime. Looks good IMHO. 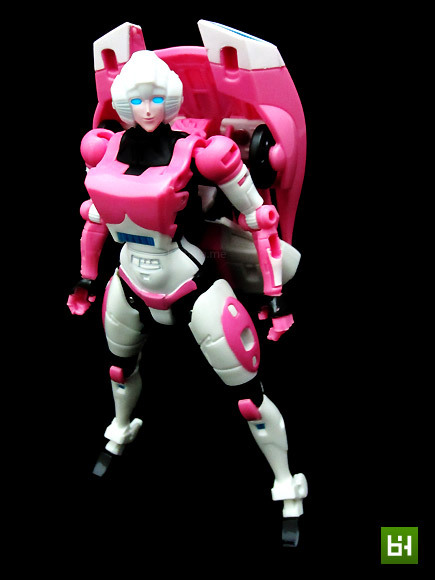 Animated Arcee is the biggest and bulkiest of all (well, at least for robot mode). 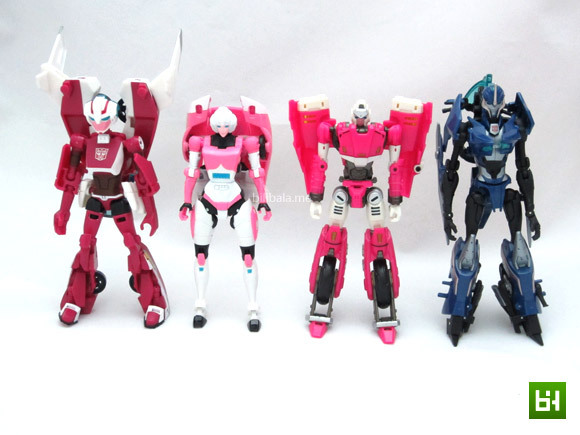 Interestingly, the size of the Generations Arcee and the DX 01 is actually the samr. On the contrary though, there is a big gap in pricing between them. 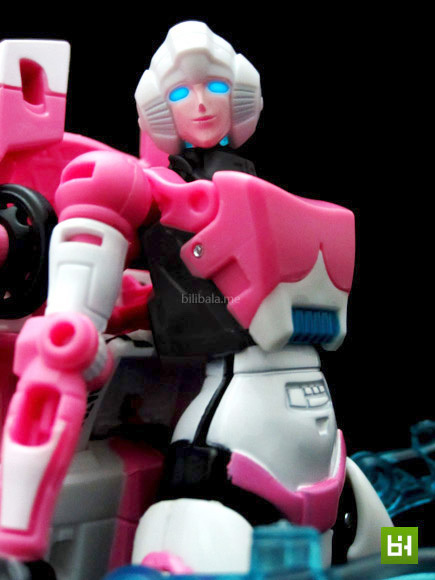 A comparison with her sister, Chromia who is being released in the same wave as she. 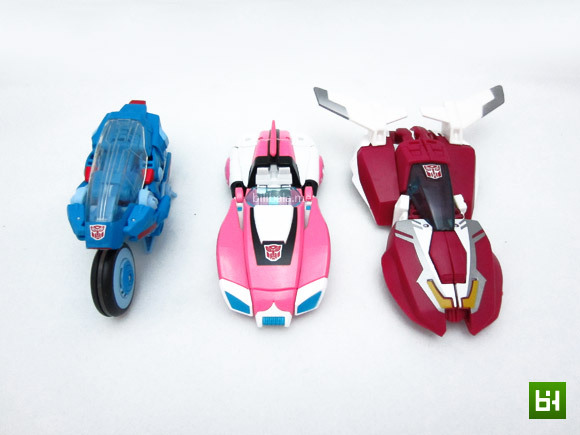 A small comparison between alt mode of Generations Arcee, Chromia and the Animated Arcee. 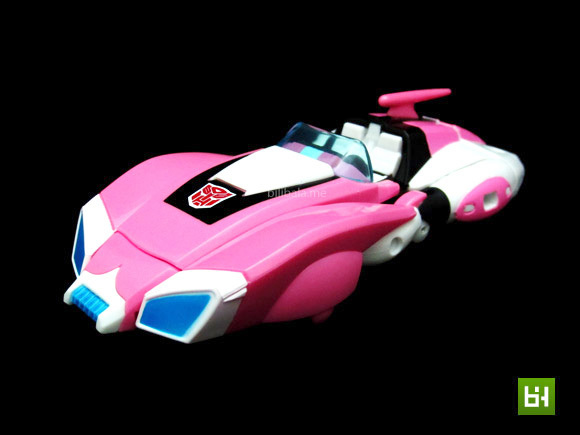 Pretty much matches the size of the animated (minus the big spoiler). 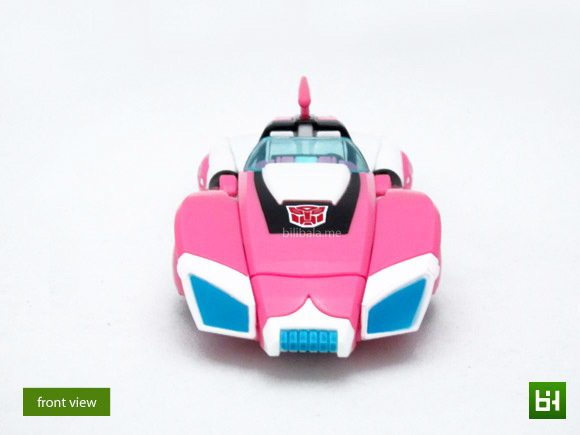 What I like – Good looking robot and alt mode design; great transformation; cool gimmicks. What I dislike?– Big backpack.